Historic Preservation – Scientific Consultant Services, Inc.
SCS Hawaii will share an award from the Historic Hawaii Foundation for its work on the Puna Moku Coastal Trail. The Preservation Honor Awards are Hawaii’s highest recognition of preservation projects that perpetuate, rehabilitate, restore, or interpret the state’s architectural. archaeological, or cultural heritage. The Puna Moku Coastal Trail is a 17-mile route between Nawiliwili and Anahola for non motorized vehicles and pedestrian access. 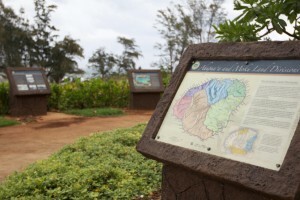 The trail is marked with interpretative signage about the region’s historical, ecological, archaeological, and cultural resources. Images from PBR Hawaii.